After the sugar rush of Valentine ’s Day, you would think I would be going along the savory route. NOPE! I am city girl but I am so excited about getting a pot plant was filed with herbs! Wonderful herbs which seem to cost a fortune if you buying them from the supermarket. This got me so excited about the combinations I could use these herbs for in savory and sweet things. So many of my bookmarked recipes have herbs as the sidekick to the key ingredient. They seem to bring out these best of simple ingredients to turn them mundane to something extraordinary. The only problem is that I have the worst record when it comes to keeping plants. You know that line in “28 days”, you should only start a relationship if you can keep a pot plant alive and dog that still likes you? Base on that I think I may be single forever. Thankfully, my dad is a jack-of-all-trades and has a good green thumb to go with it. I hope that with a bit of luck and good soil will be able to post some recipes that use some herbs fresh from my suburban garden! I have not made many tarts over my years of baking. Maybe because I think they are complicated? Anyway I have recently watched an episode of “How to cook like Heston at home” were he shared his secret to eggs. I love eggs, runny or hard-boiled are all good in my book. His technique for lemon tart seem to produce a smooth custard tart, I just had to try it. 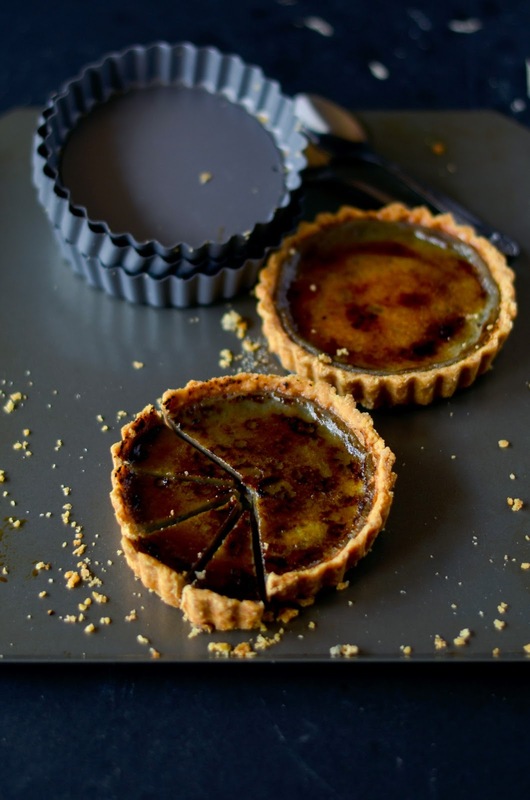 The reason why this tart is purple is that I infused the cream with blueberries as well as the lemon zest. Blueberries are currently in season here, so I might as well use them. In addition, I find the normal blueberry pie too big and too sweet, so this is variation on that American classic. The custard sets to silky smoothness I can only compare to the skin of perfectly boiled egg, but it is set just enough to melt on the tongue. 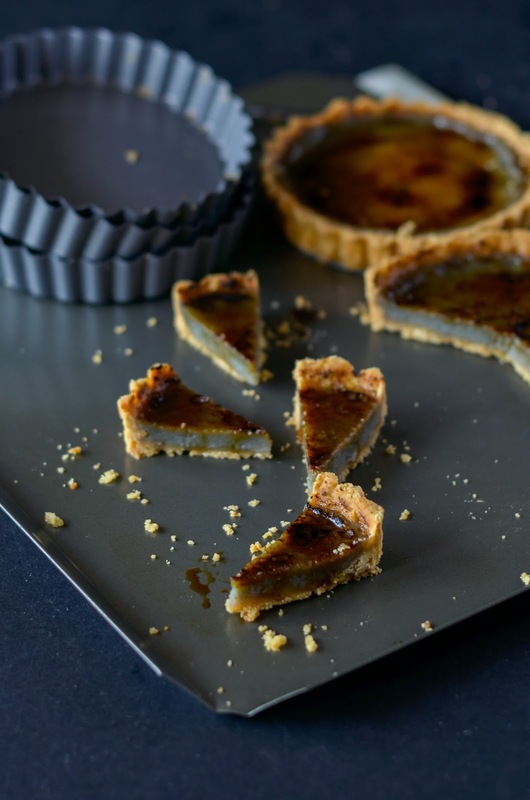 I used a whole-wheat pastry base because the nutty texture can hold the flavours of the custard better than a normal pate sure. 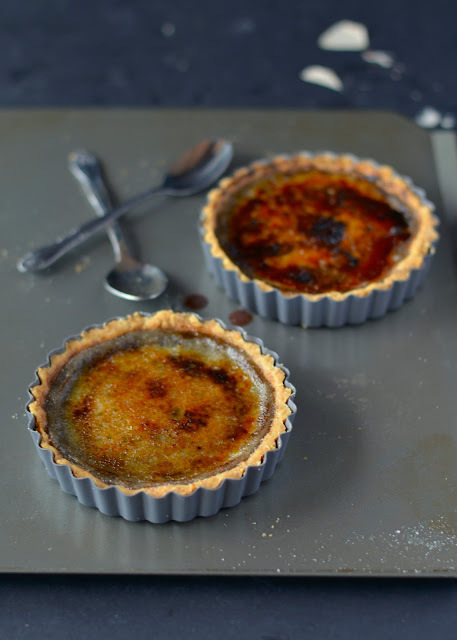 Bake a tart today, who is going to complain of the smell of pastry or custard anyway? Infuse blueberries with 300ml of boiled cream. Leave for 1 hour. Strain and leave to cool. Put all the filling ingredients into a bowl and mix together using a spatula. Place the bowl over a saucepan of simmering water and allow to warm up until the temperature reaches 60ºC. At this point, strain the mixture through a fine sieve into a jug. With a spoon, remove the bubbles from the surface of the liquid. In food processor, combine the flours, salt, vanilla and pulse for 30 seconds. After add cubes of butter in the processor and pulse until it looks like uncooked crumble. Combine the sugar and egg in another bowl with a whisk. With the processor-running stream in the egg and sugar mix until forms a rough dough. Turn out on to piece of cling wrap and pat into a flat disc. Cover with more cling film and fridge for 1 hour. 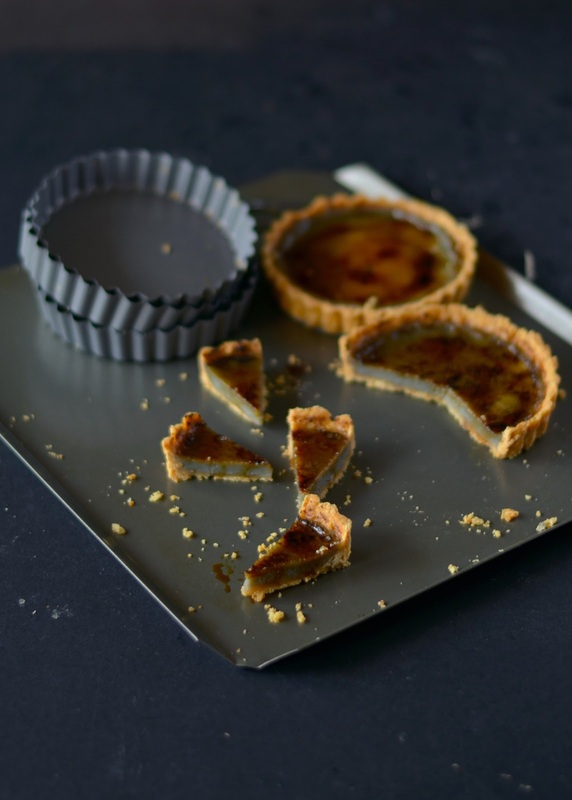 Roll out pastry to 5mm thick and line your tins of choice. Leave the overhang, you can cut this off later. Fridge for 30minutes. Preheat oven to 190c. Take your pastry tin out and prick with a fork all over. Crush a piece of baking paper up and use this as a bse to hold your baking beads or coins. Place in oven for 10 minutes. Remove from oven and take off the baking beads or coins, return to oven for a further 20 minutes until golden brown. After make a liquid pastry by mixing left over pastry with an egg. This will seal up any holes in the tart. Return to oven for 10 minutes. Turn oven down to 120c. 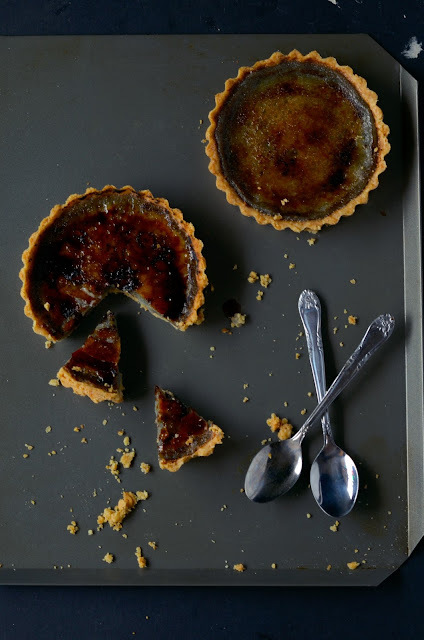 When ready to bake place tart tin in the oven to warm for 5 minutes, after pour in your blue berry filling until it is filled. Bake until the custard reaches 70c on a thermometer. I had to bake for 15-20 minutes. Transfer to fridge to cool completely. Cut off the pastry to tidy up the pie. These photos are fantastic! And I feel your pain on the pot plant front. I manage to kill even the hardiest of plants. AKA a cactus. Thank you for the compliment to my photos! I hear you sister, I have killed too many plants in my life time, my worse is forgetting about a bamboo. Wow, these tartlets are so pretty and different from majority recipes our there. Lovely! I like the fact that it is crunchy as well as creamy. 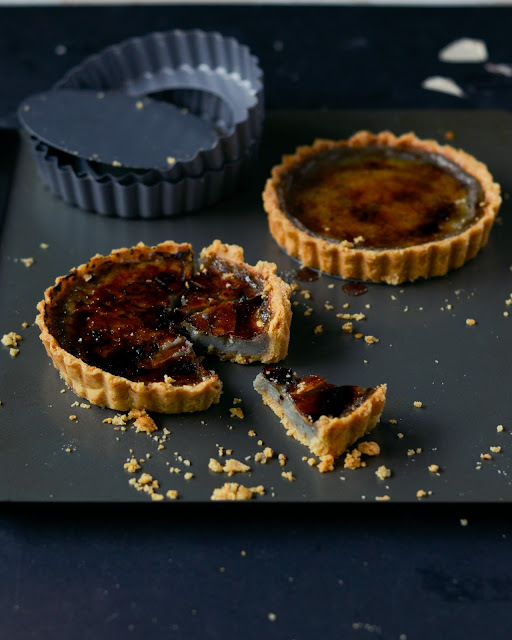 Too many tarts lack texture. I hope you enjoy this recipe! I can’t understand the pastry directions.Are the two flours different? then,add salt,vanilla Salt? and pulse blendor? I guess I should be able to figure it out myself-except that I’m not very smart.I’d appreciate the help I can’t do myself. 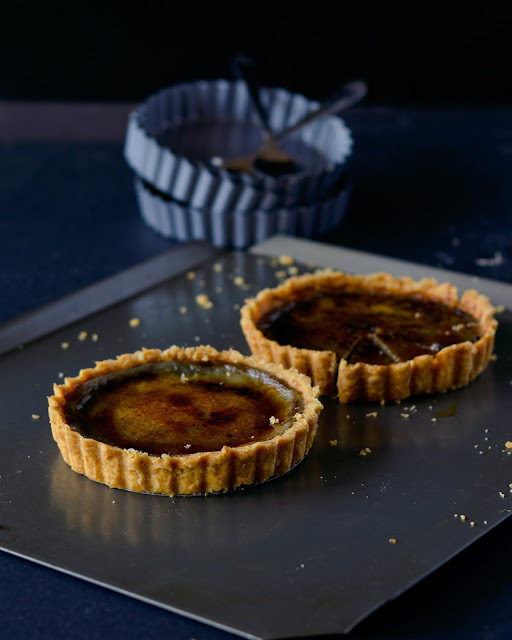 Pastry flour or low gluten flour will deliver a more crumblier tart shell than whole wheat pastry flour. It will still work and probably deliver the texture of more traditional short crust pastry. I like the combo of the two but i used the full whole wheat here.